On our 1 hour Introduction Tour you will learn the basics of kayaking or paddle boarding with a guide as we paddle along the scenic shoreline of the Hood Canal viewing eagles, fish and marine invertebrates along the way. Once you are comfortable, you are welcome to paddle off on your own*. In addition to learning how to kayak or paddle board, you will learn about the local marine environment while our Biologist or Naturalist points out interesting and important flora and fauna. This tour is also especially popular with young children and with those who have only a short time to get out on the water. 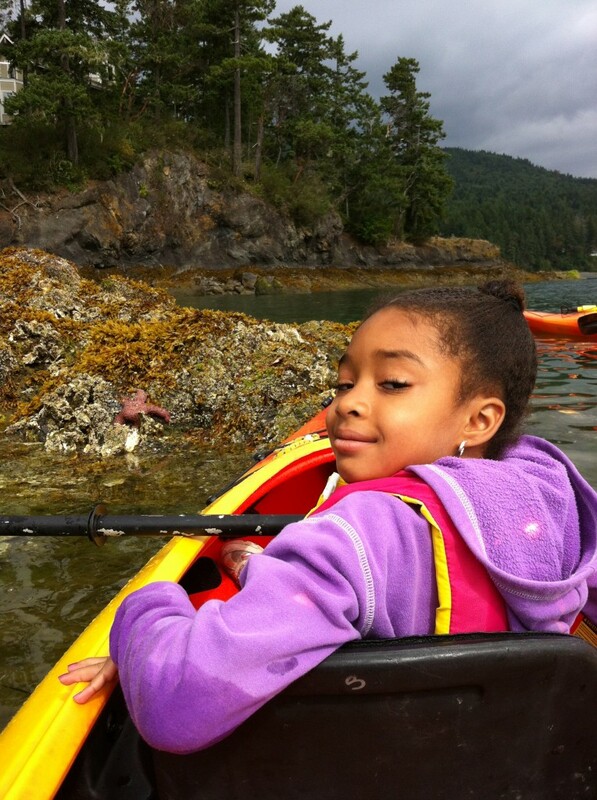 Kids love tidepooling the rocky coastline of the Hood Canal! Add $25 per pot to go crabbing while on the tour. You must bring your WDFW shellfish license and bait to take your crabs home. Contact us to make your reservation. At least 48 hours notice is highly recommended for peak season reservations. *If you choose to extend your time on the water at the turnaround point, you will be charged per additional half hour ($8.00) after the one hour mark has passed. Dress for the weather! If it’s hot bring a hat, sunglasses and sunscreen. If it’s rainy or cool wear a rain jacket, hat, and a pair of water resistant pants. Shoes or sandals that can get wet are recommended. Remember, you’ll be wearing a life vest which adds warmth and bulk so heavy jackets are not recommended. Most of our kayaks have dry hatches so you can always bring a little more than you might need if the weather is unpredictable. We also recommend bringing a bottle of water on all tours especially on hot days. Bring your camera and cell phone at your own risk. Most folks do, and there are rarely problems. We also have some dry bags to lend out but you may need to request one in advance. Copyright (C) 2018 Hood Canal Adventures, Inc.